EDINBURG— A pilot program through which eight Pharr-San Juan-Alamo school district high school students became the first in the nation to receive an associate degree in nursing along with their high school diploma, is now being used a base model to offer a similar opportunities to hundreds of Rio Grande Valley students. The program, called HEAL2, received a $3 million Investing in Innovation grant from the U.S. Department of Education to offer nursing prerequisite courses to high school students as dual enrollment, while also exposing and recruiting eighth and ninth grade students. The grant was proposed through a partnership between Region One Education Services, SouthTexasCollege, DoctorsHospital at Renaissance, and the school districts of Pharr-San Juan-Alamo, South Texas and La Joya. “That’s what makes it innovative, that you are seeing the connection with pre-K-12, with post-secondary, to the actual organization that employs those individuals,” said Eduardo Cancino, Region One deputy director of instructional support. Starting in the fall, 50 students from each district will begin taking the prerequisite courses for the nursing program while in 10th grade. Out of those 50, up to 20 students will be selected after high school graduation to enter the associate degree in nursing program, or ADN, at STC. “By the 12th grade they are going to be graduating high school with all of the requirements for the ADN and summer one they will be taking their first course in nursing, which is introduction to nursing,” said Jayson Valerio, interim dean of nursing and allied health division at STC. The initial pilot program was through PSJA school district, STC and DHR, which allowed those involved to grasp a better understanding of how to manage an endeavor of this kind. The students were trained by DHR staff at their hospitals and like the initial eight, new participants will have a secure job at DHR, officials said. DHR has recently been given the green light to expand to full capacity, which means adding 500 beds, Forse explained, so the expectation is to have room for many students who choose to seek careers there, while also acknowledging that other hospitals in the area will also benefit. 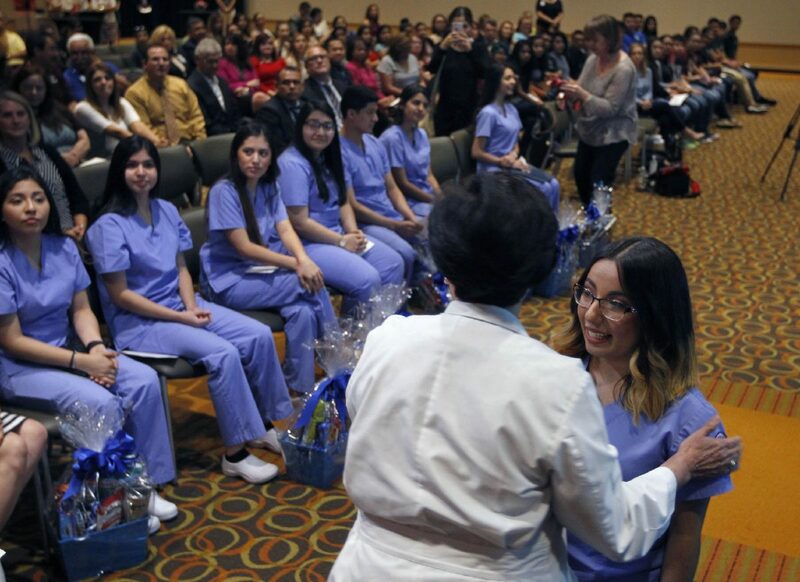 The original eight PSJA students completed the associate degree at the same time they earned their high school diploma, for which the college had to get special approval from the Texas Board of Nursing. But that hurdle will not be necessary for this program considering those selected will enter the associate degree program after graduation, Valerio said, so they would be admitted to the program as traditional students. But for those who end up taking the prerequisites and might not be accepted to the program, the idea is for them to have that early exposure to the field and credits that can be used to apply for the program again later or change fields. As far as exposure for students in eighth and ninth grade, the college and school districts will provide information meetings with parents, as well as online career-coach-mentor tests aimed at giving those students interested in the healthcare what some of the career options might be fit for them, and information on the daily duties of professionals in those fields, Valerio said. The overall idea is to start preparing younger generations with information necessary to choose a career in nursing, which could in the long-run dispel concerns of students going in blind and wasting time taking courses they won’t really need. For STC, Valerio said being involved since these early stages will be a great advantage considering those who actually enter the associate degree program must be ready to meet the demands and rigor.